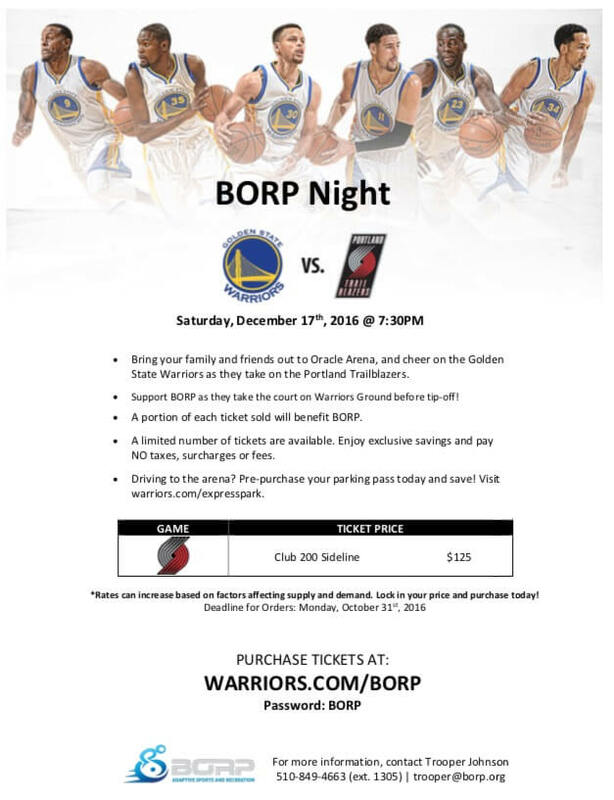 Buy a Ticket to BORP Night at Oracle Arena with the Golden State Warriors! Bring your family and friends out to Oracle Arena and cheer on the Golden State Warriors as they take on the Portland Trailblazers on Saturday, December 17! A portion of every ticket we sell will benefit BORP. A limited number of these specially priced tickets are available, so purchase yours today! Support BORP’s youth wheelchair basketball players as they take the court on Warriors Ground before tip-off! If 100 tickets are purchased through this opportunity, the BORP Jr. Road Warriors will have a chance for an on-court experience at the coliseum prior to the game. Driving to the arena? Pre-purchase your parking pass today and save! This is an amazing opportunity to go watch the Golden State Warriors and support the BORP Jr. Road Warriors, the varsity wheelchair basketball team. The Golden State Warriors are the defending Western Conference Champions and returning after back-to-back appearances in the NBA Finals. Last season the Warriors capped off a NBA record setting season, winning 73 games. Their off-season trade to acquire Kevin Durant has made the Warriors even stronger this year and a favorite to make another appearance in the NBA Finals. Come out and watch history in the making. BORP offers the only competitive wheelchair basketball program in Northern California for kids with physical disabilities. The Jr. Road Warriors is the varsity wheelchair basketball team and competes against other teams of kids playing wheelchair basketball throughout the country in weekend tournament events. Kids with permanent lower-limb impairments (paralysis, amputation, cerebral palsey, spina, bifida, etc.) are eligible to compete in wheelchair basketball. For more information, contact Trooper Johnson at 510-849-4663 (ext 1305) or trooper@borp.org.